Oprah named this blended concoction from the New York City-based Serendipity 3 one of her “Favorite Things” in 2006 saying that it makes her want to “dance on the chandeliers.” Started in a basement on East 58th Street in 1954, Serendipity 3 has been a top stop for many celebrities though the years. Tennessee Williams and Jackie Kennedy were regulars. Andy Warhol used to pay for his meals with original drawings. With locations now open in Boca Raton and Las Vegas, Serendipity 3 is more than just a sweet shop, and also serves omelettes, salads, pizza and ribs. 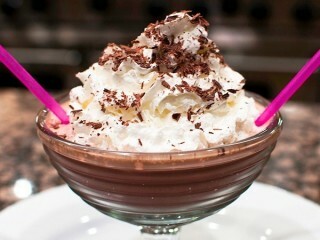 But the joint is best known for its Frrrozen Hot Chocolate, which is ordered by around 10,000 customers each month. In the restaurant each frosty creation is made by combining a secret dry mix with milk and ice in a blender on high speed until smooth. The dessert is poured into a huge goblet, topped with whipped cream and chocolate shavings, and served with spoons and straws. 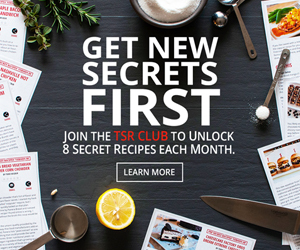 The chain claims the secret mix is a blend of many different chocolates, and then released a recipe to the Oprah Winfrey Show a while back (posted on the show’s website) which supposedly revealed the secret formula. But it appears to be way off. The recipe given to Oprah says to use 6 half-ounce pieces “of your favorite chocolate,” but the chocolate in the restaurant’s secret dry mix comes only from cocoa powders. Also the recipe doesn’t mention anything about nonfat dry milk which is a big part of the dry mix. All you have to do is look at the ingredient list on the package of mix to see “sugar, nonfat dry milk, dextrose, and cocoas.” That’s it. But you don’t need to order a 5-dollar package of mix to enjoy this dessert. I’ll save you a little time and money with this original Top Secret Recipe I’ve worked up which uses three popular brands of cocoa, plus dry milk and sugar. Blend this mix with whole milk and ice and you’ll have a delicious (and cheap!) clone of Oprah’s favorite drink that tastes better than any recipe out there. Watch Todd make Serendipity 3 Frrrozen Hot Chocolate in this video.